The growing need for competitive and practice soccer fields had to be solved. A community park was needed for large gatherings, special events, and annual festivals. Recreational and unprogrammed park uses needed equal space and accessibility as youth sports leagues. 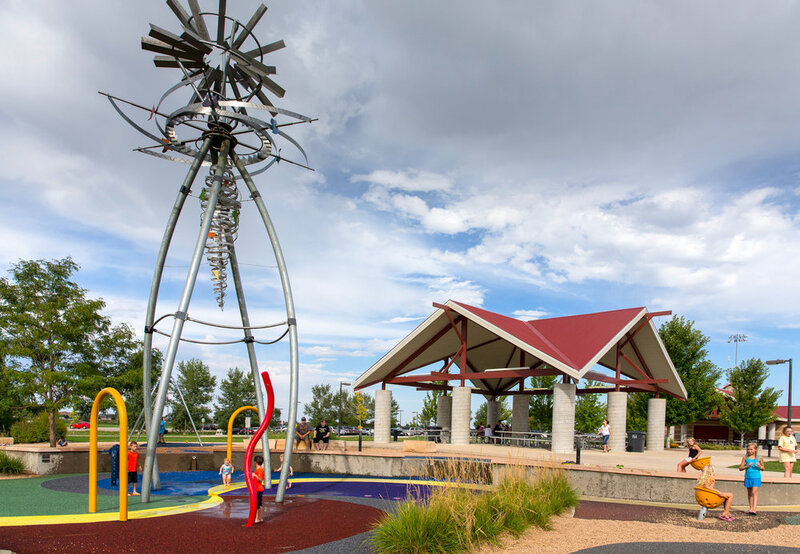 The sports park is located on an historic Colorado farmstead so we incorporated an agricultural theme to bring the site character and connection with the Loveland community. The setting includes a windmill, cherry orchard, irrigation ditch, entry sign depicting stacked bales of hay, stone benches that portray hay bales, stone monuments to identify field numbers, shelters with red roofs to symbolize barn cupolas, and a Wizard of Oz themed playground. Conservation was a major element in our planning process. We used raw water for irrigation, bioswales for pretreating storm drainage, and recycled water from the spray park to irrigate the turf. The Sports Park was the first municipal synthetic turf field in Northern Colorado, installing it on the fourteen separate sports fields.